The number, complexity, and velocity of risks are increasing and the speed at which these risks are emerging means that your organization has a much shorter period of time to respond. Under certain circumstances, if you react too slowly, you could find yourself out of business. To be effective, organizations must be able to consistently identify, assess, decision, treat, and monitor risk through its entire lifecycle in order to respond ahead of the curve and to be prepared when new risks emerge. In addition, your business managers must understand their role in managing risk and find ways to get in front of it with limited resources. Without a way to identify priorities and accountability, risk management efforts are often misaligned and the business is left scrambling to react to risks when bad things happen. The focus of this webcast is to explore these challenges and how they can be addressed by implementing operational risk management best practices. 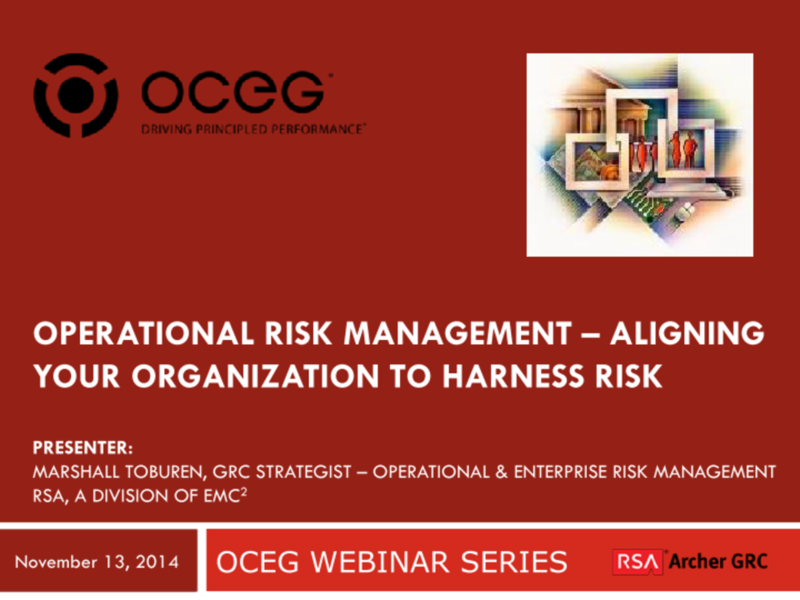 We have emailed instructions to access Operational Risk Management – Aligning Your Organization to Harness Risk Slide Deck to . Make sure the email arrives in your inbox: either add "support@oceg.org" as a safe sender to your email platform, or if you use Gmail, drag our email into your Primary tab.